Posted in: Kershaw Designs, Radio Control, Traxxas. Tagged: New Releases, RC. If you are tired of stripping down your Traxxas Summit or E-Revo because of a broken chassis, then Kershaw Designs has a solution for you. This is the latest version of their popular upgrade. It is more than 1/2lb lighter than the original and offers more clearance for bigger lipo packs. 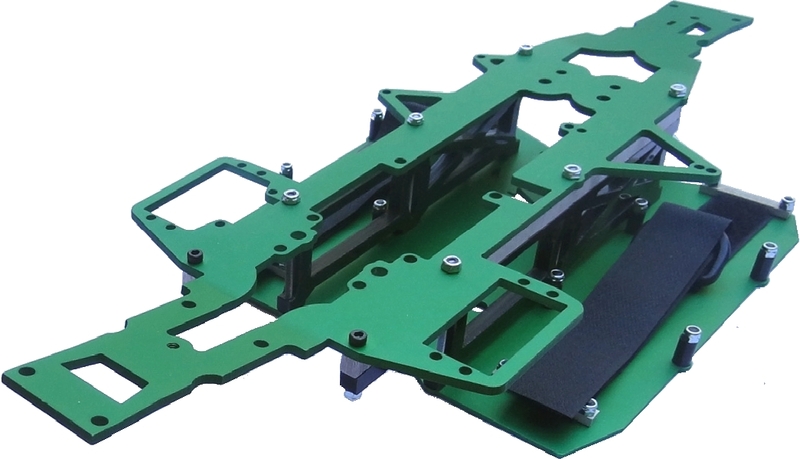 The chassis kit now includes 2x 1/4″ aluminum braces that run the length of the chassis, receiver box mounting tabs, improved tolerances and clearance and all for $20 less. This chassis is only 2oz heavier than the stock E-Revo/Summit chassis. The chassis is made from 100% heat treated aluminum and is available in a variety of colors: bronze, copper, matte black, green or aluminum.